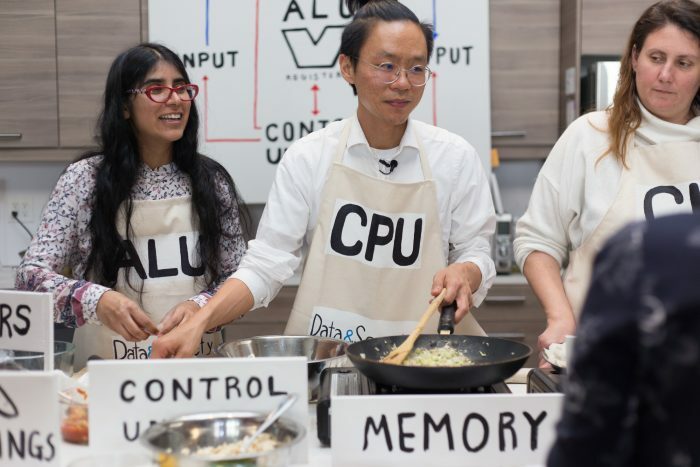 CPU Dumplings Workshop is a cooking class to learn the fundamentals of computation. 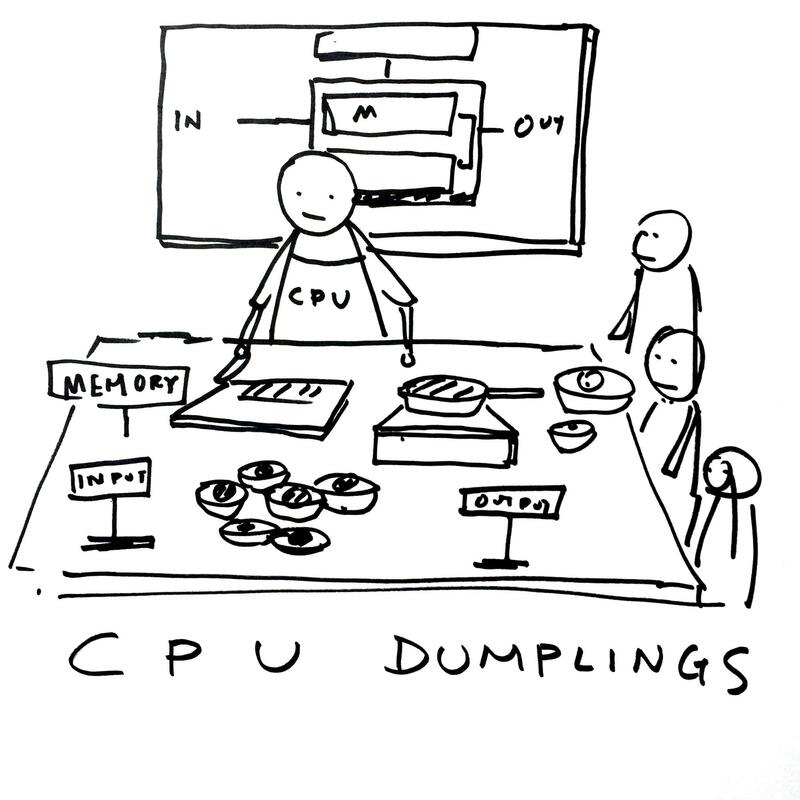 Taeyoon Choi started working on CPU Dumplings Workshop at the School for Poetic Computation in Spring 2014. 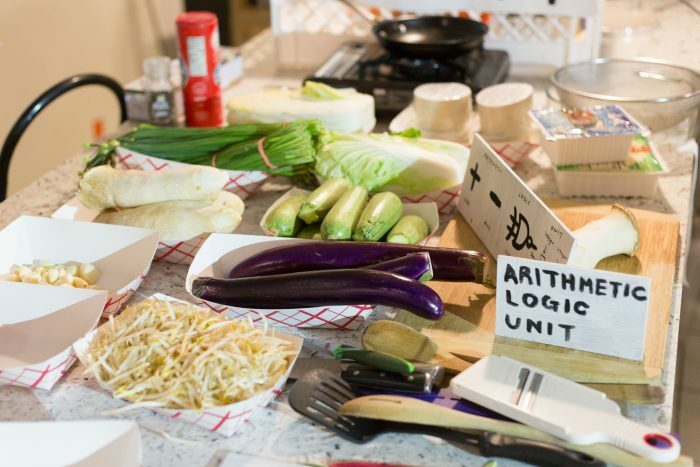 The workshop was publicly presented for the first time at the Cybernetics Conference in 2017. 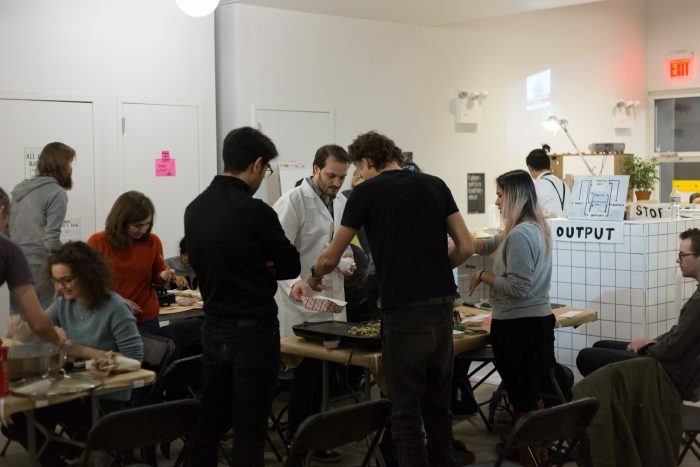 The latest workshop took place at the Data and Society Research Institute‘s loft in January 2018. 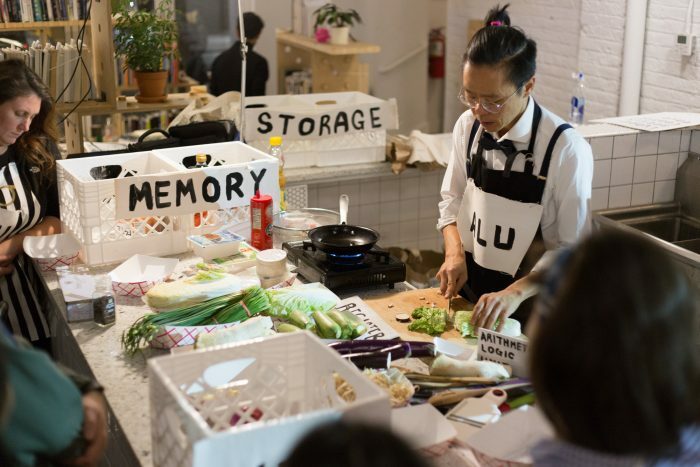 Participants perform all the operations of a CPU(Central Processing Unit) by learning to chop chives, mince onions, fill and fold dumplings to become a part of a human computation that simulates a CPU instruction set. 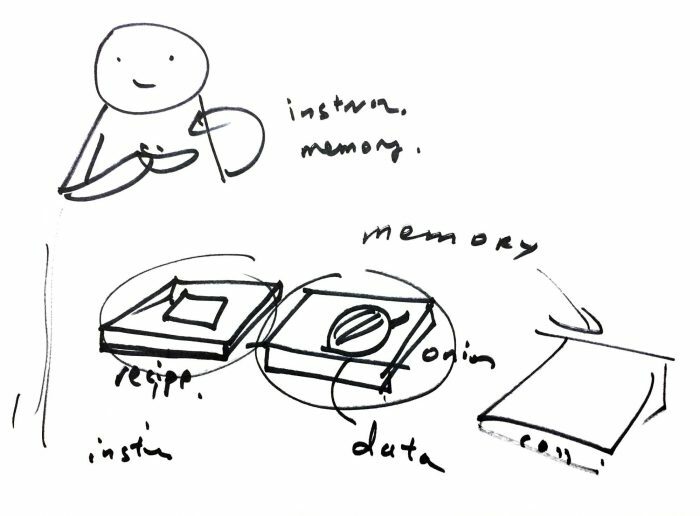 Taeyoon, in collaboration with guest computer scientists, introduce topics including the Von Neumann architecture, ALU(Arithmetic Logic Unit) and CU(Control Unit), memory and storage, serial and parallel processing, and bottleneck problem. A full graphic novel with technical details will be published as a part of Handmade Computer on Avant in Spring 2018. 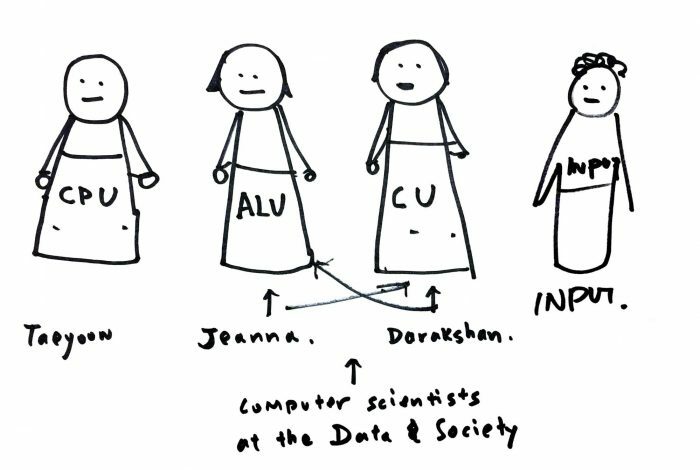 Featuring Data and Society fellows and computer scientists Jeanna Matthews and Darakhshan Mir. 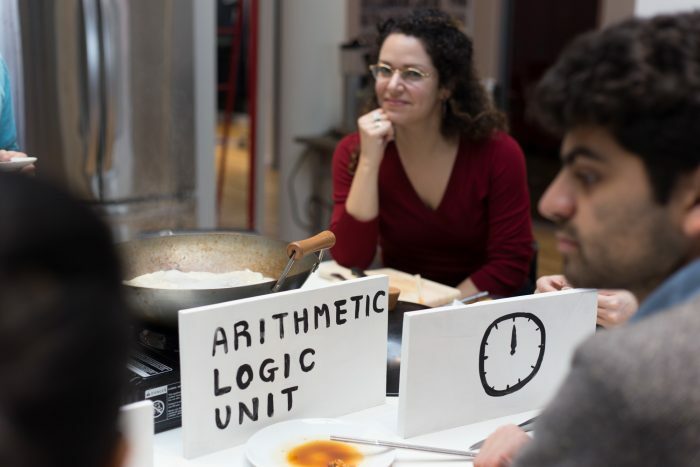 Computation is like cooking: chopping, mincing, frying, and steaming, every operation is an action. 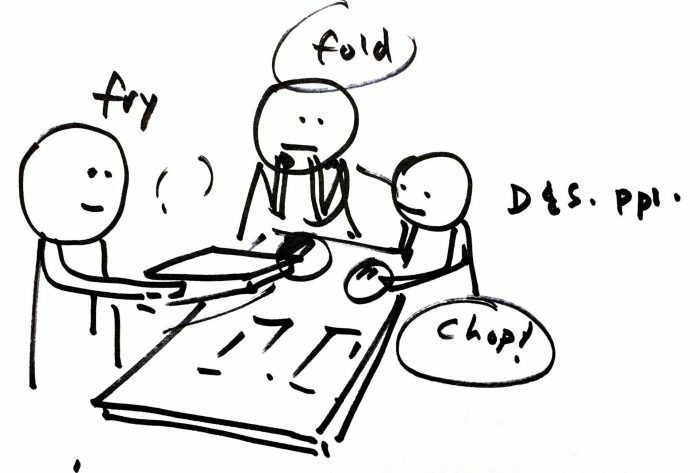 To make a meal, CPU requires stringing actions together with the right sequence and timing. 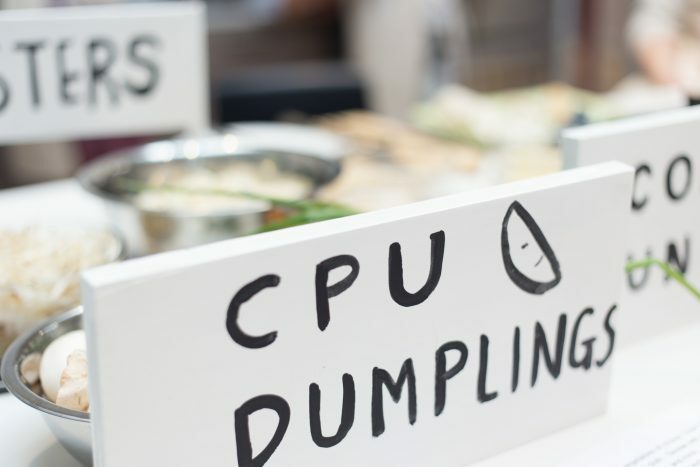 When the CPU receives a request for a new dumpling order, it makes logical decisions about how that order should be cooked. CU tells everyone what to do. She fetches instructions and makes sure the kitchen carries them out. CU doesn’t do this all on her own, but she’s the only one who knows what’s going on in the kitchen. She assigns the jobs to chefs who are extremely proficient at carrying out her instructions. The ALU are the chefs who do all the cooking. 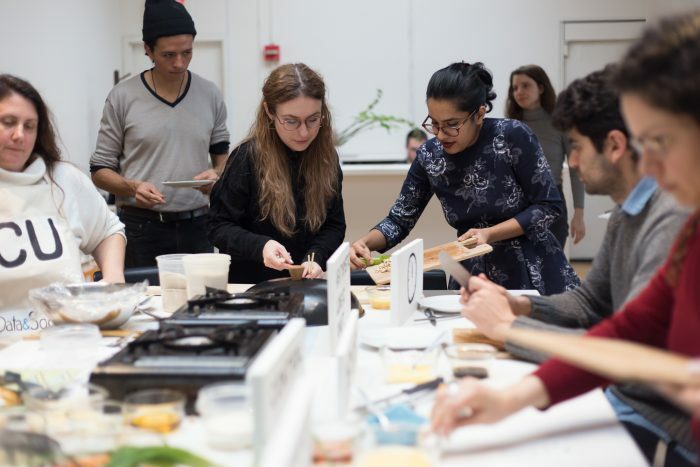 Like line chefs, each is focused only on their own task, but performed together their actions make the finished dumplings. Data and Society Photos by Livia Huang. Wash and mince vegetables of choice. Season with salt, and drain by squeezing lightly with cloth. Sautee the vegetables with oil, a little soy sauce, white pepper, and mirin. Do not overcook. Boil sprouts (for 3 minutes) and drain. Dice Tofu into small blocks 3 inches wide and drain. If you want shrimp, mince and mix all ingredients with some beaten egg and seasoning. Do not cook. Put dumpling skin on your palm. Scoop one spoonful of filling into the upper middle of your skin and flatten slightly. Wet the edges of the skin with water or egg. Fold the skin over the filling in the palm of your hand (like you’re curling your hand), and pinch the edges closed securely. Do not tear the skin. Massage the dumpling so that the filling is evenly distributed. Oil the pan and put on low heat. Place dumplings flat on their sides and add a little water for steam before closing the lid of the pan. Cook until the skin turns light brown. Add additional water if necessary to retain moisture. Flip dumplings to other side and cook until light brown. Cybernetics Conference Photos by Chris Woebken. 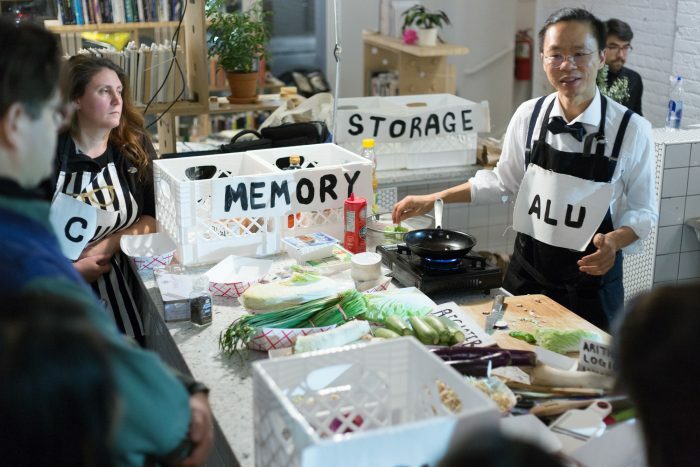 Special thanks to Taeyoon Choi Studio team (Livia Huang, Emily Miller), Avant and Cybernetics Conference (Sam Hart, Melanie Hoff, Francis Tseng, Alexis Convento), Data and Society (Alexandra Mateescu, Karman Lucero, Kinjal Dave, Madeleine Clare Elish, Rigoberto Lara Guzman, Sam Hands Garcia, Natalie Kerby) and Siyi Chen from Quartz.